As a nation, Australians love nothing better than beautiful, lush, green landscapes. We love our home lawns with a passion, thrive on our sporting achievements and from a young age we spend our weekends participating in team sports at local club grounds. Not forgetting our armchair sporting enthusiasts who marvel at the quality turf surfaces that our race courses and stadiums show off at huge events like the Melbourne Cup and the AFL Grand Final! A bit of turf know-how makes it easy to create and maintain a premium turf surface for your needs. Warm season grasses grow best in temperatures between 28 and 32 degrees celsius and include Couch grass, Kikuyu, and Buffalo grass. They have better heat and drought tolerance than cool season grasses and are suited to temperate areas of Australia, including New South Wales, Queensland and Western Australia. Cool season grasses like Ryegrass, Fescues, Bluegrass and Bentgrass grow best in temperatures between 15 and 25 degrees celsius. They are at their best during the spring and autumn periods, and are suited for the cooler climates like those in Tasmania, South Australia, Victoria, ACT and some areas of New South Wales. Golf courses – bentgrass provides a quality look for greens with their ability to withstand low mowing heights and dense coverage/Couch grass fairway (low water use) giving the ability to withstand the harsh Aussie summers. Fine fescues suit roughs and areas often unkept due to their whispy nature and ability to grow in low fertility locations. Sportsfields – generally a three-way Rye blend for autumn, incorporating oversowing of couch grounds in March/April, with Ryegrass to provide winter cover for fields during Football and Soccer season, to enable play through the cold and wet periods. Cricket grounds – turf covers are widely utilised in the Turf Industry now to protect the centre wickets tables from high rainfall in winter, and also for their ability to create a “hothouse” effect on the turf and encourage growth when the turf is struggling to self-repair in cold temperatures. Recreational areas/parks and gardens – use Rye/Kikuyu blends, which are hardy with the ability to keep a green colour all year round when inputs such as mowing and fertilisers are low in council maintained areas. Domestic lawns – tall Fescue/Kentucky Blue can be popular due to their dark colour and are ideal for cooler climates Melbourne/Tasmania /Canberra are ideal for these varieties to be sown April-Sept. The quality of one line of seed to the next can vary dramatically, be it the purity of the seed or the germination percentage. Cheaper seed is not always the best option for your projects. Poor germination and high levels of weed matter are factors that allow seed to be sold cheaply into the market. A cheaper seed might seem like a great saving but there’s no bargain to be had when you end up with poor quality or dead turf. Advanced Seed follow seed standards endorsed by the Australian Seed Federation and always specify the details when it comes to our lawn seed. ment and it is vital to ensure your base is level and free of rocks or unwanted materials that may hinder seed germination. Give yourself time to prepare your soil. This allows time for digging and fertilising, while at the same time removing any weeds that might sprout during your preparation time. Applying a starter fertiliser at the time of seeding will assist in feeding the new growth and creating a healthy root mass for the new seedling. To enhance strong seedling growth use a starter fertiliser that is high in phosphorus but low in nitrogen to promote early root growth and establishment. When applying the fertiliser, spread it evenly. Divide the fertiliser in two and apply it in two directions, spreading the first half in one direction and the second half at right angles so the whole lawn is fertilised twice. After spreading is complete ensure the fertiliser is watered in well. This is the most critical stage. 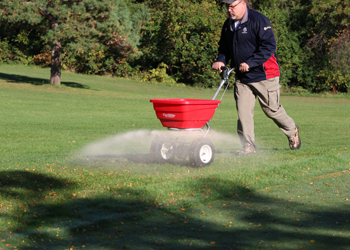 Always use a seed spreader where possible to ensure even quantity of seed is applied across the entire area. Best practice is to sow in two directions; for example north to south, then east to west. This will ensure even surface coverage. Commercial spreaders from Earthway easily spread evenly and come in a range of models to suit your project requirements. All seed must be frequently watered in the first 4-6 weeks post-seeding. Keep an eye on windy or overcast days; it doesn’t have to be hot for the seed to start to die off. Irrigate enough to ensure the soil is wet through but not flooding; flooding may cause seeds to wash away. For small projects use a garden fork or for larger projects hire equipment such as scarifyers or needle tine machines which can aerate large areas efficiently. • Fertilise with a high analysis product. Top dress now to stimulate new growth. Apply a mixture (usually made up of peat loam and sand) over your lawn. 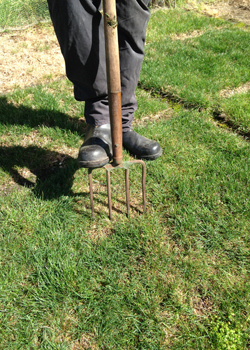 • Aerate or spike your lawn in autumn with a fork. It is simple and easy to do and will improve soil drainage and stimulate the growth of new roots. Push the fork down with 30cm spaces allowing water and nutrients to enter the roots quickly and more effectively. Over time, turf surfaces become compacted and grass doesn’t grow well. Without aeration your lawn can become thin and bare. Aerate depending on grass type and its quality. Spring – often thought of as the best time for Turf! • Longer watering times, and less often. Watering for longer means water will penetrate better, get down deeper and promote greater root depth. • Plant Couch and Kikuyu as they need soil temps 25 degrees and above. These varieties will withstand the summer heat once established. • Raise mowing heights to relieve turf of stress in the midst of summer. 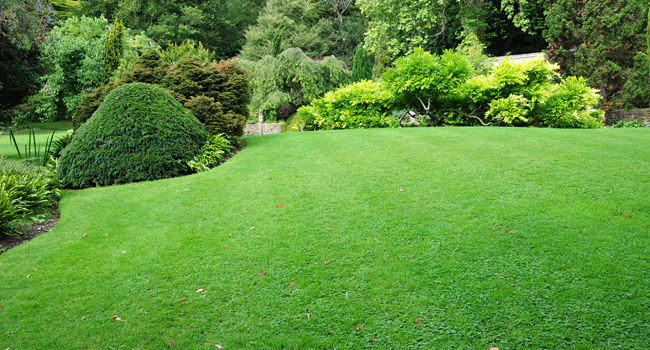 A longer grass length means the lawn holds more moisture and can withstand the heat of summer better. • If you have a good cover at the start of winter it eliminates space for weeds to germinate. 1. Use some force to drive your garden fork into the compacted lawn. 2. When the fork is in the soil push back on the handle to make a crack in the soil. Reaper this across the area that needs aerating. 3. If you wish, you can fill the holes you have made with sand or top dressing soil. Spread the soil over the top using the back of the rake. 4. Press down to fill in the holes, making sure it is evenly spread over. 5. Water your lawn thoroughly. The gaps you have made will allow the water to penetrate the roots. • Lower heights in summer to encourage warm season grasses to flourish and raise in winter when growth is slower. • When mowing for the first time it is important to allow the grass to establish well. • Cut the grass for the first time when it is around four to five centimetres high. Trim lightly and gradually lower the blades to an ideal cutting height of 25-30mm. Mow regularly, trying not to remove more than a third of growth at any time. • Do not mow whilst the grass is wet. If your mower does not have a roller then the lawn can be rolled after this first cut. This will encourage lateral growth making a more closely knit turf. • The best advice for mowing a home lawn is “little and often”. • For the last few cuts of the year gradually raise the height of the blades. Also follow this advice in dry summer periods. When mowing regularly the cuttings can be left on the lawn. With fewer cuttings it is recommended to remove them for use in compost or mulch. 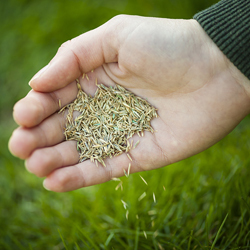 Sowing new seed into your existing turf rejuvenates it and improves its colour. It is a great way to renew the surface when sports, kids, pets and seasonal conditions give it a hard time. By oversowing seed into your existing turf you will fill in patches, thicken and strengthen your lawn and protect it from invasion of weeds and diseases. Overseeding also helps new grass retain its green colour longer in the drier months. A newly seeded area develops stronger roots than older grasses, and turf that has been oversown will also be less prone to weeds as denser areas have less area for weeds to take hold.